If you need help for anything, or have questions, or just want to order prints over the phone, please don't hesitate to call. Our number is: (480) 948-4349. Or contact us via email and we'll call you. We are generally available 8AM to 5PM MST. We appreciate your support. The world's largest known natural bridge in its exquisite setting. EXPERT ADVICE! Get a Travel Itinerary - Trip Planner tailored to your trip by the AWT Editor, based on his first-hand experiences. Free Assessment. Check out our new website today! 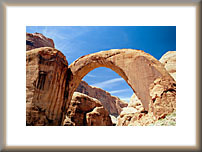 Copyright © 1996-2019 ASA Consultants, Inc. All Rights Reserved.| How to contact The American West Travelogue.